Amanda Stanley from Meigs EMS and Edna Weber from Farmers Bank judge cakes as part of the annual March for Meals fundraiser. Tammy Grueser (Swisher & Lohse Pharmacy), Rosemary Eskew (Pomeroy Flower Shop) and Tayla Porter (Mark Porter Chrysler, Dodge, Jeep & Ram) judge cakes at the March for Meals fundraiser. 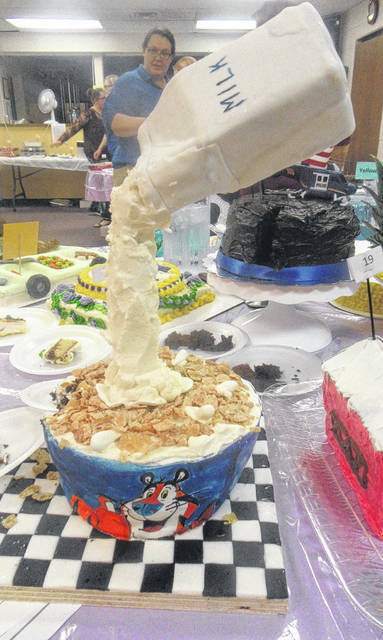 “Don’t Spill the Milk” was one of the many decorated cakes entered in the contest. The cake decorated by Sammi Mugrage was named the grand champion. The law enforcement themed cake by Jeremy Fisher took home the Director’s Award. POMEROY — The annual March for Meals campaign to benefit the Meigs County Meals on Wheels Program raised nearly $20,000 for the organization. March for Meals is a nationwide observance to raise funds and awareness for the Meals on Wheels programs around the country. 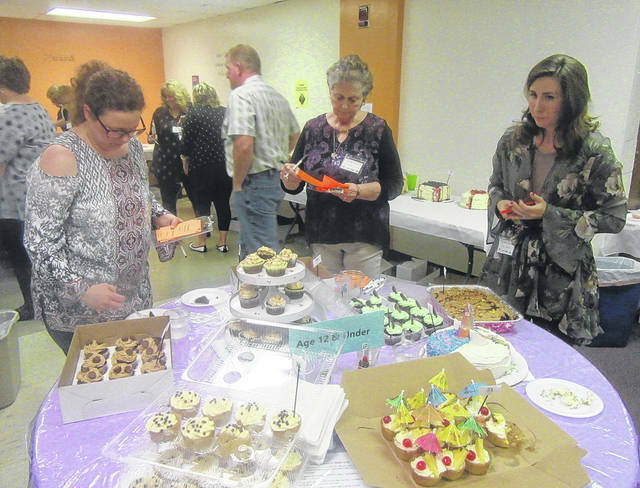 The fundraiser event and cake contest/auction marked the 17th year for the event in Meigs County. According to Meigs County Council on Aging Director Beth Shaver, the number of home delivered meals in Meigs County increased by over 4,500 in 2017 over the previous year and the senior noon meal at the center increased by 1,300 in the same time frame. As the older population grows the need for services grows also, explained Shaver. The Meigs Council on Aging delivered over 10,000 more units of service in 2017 than was delivered in 2016. This includes meals, homemaker services and other available services provided through the agency. This year’s March for Meals fundraising included the Council on Aging’s Winter Games held on January 30, the Home National Bank’s Stop Hunger Games in March 15, sponsorships, dinner tickets, contributions and the cake auction. The grand total for the fundraising effort was $19,603. Shaver stated that the money will be used to expand on the Short Term Meal Program for seniors upon discharge from a hospital or nursing home and the Summer Produce Coupons. “We will also set aside part of the money to purchase shelf stable ‘Blizzard Bags’ for our consumers in December. The Blizzard Bags are filled with enough food for at least three days and are to be used during weather emergencies,” said Shaver. The remainder of the money is used as part of the local dollars that support the senior nutrition programs. Billy Goble served as our auctioneer for the cake auction. The previous auctioneer, Jim Taylor and his wife, Vicki were there as the Council’s special guests. Sponsors for the event included: Corporate – Farmer’s Bank and Savings Company and Home National Bank; Platinum — Transitions Home Health Care and Hospice; Gold — PDK Construction, Inc., Swisher & Lohse Pharmacy, Mark Porter, Chrysler, Dodge, Jeep & Ram, McDonald’s of Pomeroy; Silver — Racine Optometric Clinic, Melanie Weese, OD, D.V. Weber Construction, Inc., Valley Lumber, Elite Home Nursing Services, LLC, Taz’s Marathon, Douglas Hunter, MD, Hill’s Classic Cars, The Vaughan Agency; Bronze — Oliver Packaging & Equipment Company, Ridenour Gas Service, King Ace Hardware, Angell Accounting Associates; Door Prize Donors — Elite Home Nursing Services, LLC, Tuckerman’s, Fox’s Pizza Den, Angell Accounting Associates, Linda Warner, Randy Smith and Meigs County Council on Aging, Inc.
Cake Bakers (49 cakes were entered) — Jamie Cremeans, Addalynne Matson, Karen Circle, Mary Morton, Nicole Holley, Ashley Enslen, Eva Enslen, Carol Tate, Lori Miller, Annisha Ball, Lauryn Woodall, Maddie Combs, Tina Richards, Jeremy Fisher, Shannon Miller, Jackie White, Layla Glaze, Kara Glaze, Kelsey Roush, Amber Blackston, Karen Roush, Heather Browning, Courtney Roush, Angela Roach, Samantha Wolfe, Rita Ball, Reilly Wolfe, Sammi Mugrage, Avary Mugrage, Bambi Fisher, Jessica Lukouski. Cake Buyers: Oiler Livestock, Home National Bank, Mark Porter, Transitions Home Health Care, Farmers Bank and Savings Company, Swisher & Lohse Pharmacy, Shear Illusions, Beth Shaver, Sammi Mugrage, Colleen Murphy-Smith, Vaughan Agency, Ridenour Gas, Tina Richards, Alice Wolfe, Jeremy Fisher, Amanda Stanley, Birchfield Funeral Home, Jack’s Septic Service, Chris Tenoglia, Carson Crow, Sarah Arndt, John Matson, Tammy Cremeans, Danny Davis, Linda Warner, and Jay Edwards. 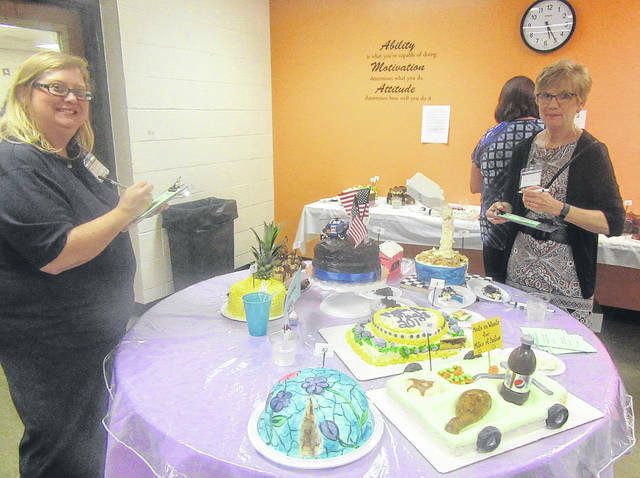 https://www.mydailytribune.com/wp-content/uploads/sites/42/2018/04/web1_4.8-Cakes-120184613143222.jpgAmanda Stanley from Meigs EMS and Edna Weber from Farmers Bank judge cakes as part of the annual March for Meals fundraiser. https://www.mydailytribune.com/wp-content/uploads/sites/42/2018/04/web1_4.8-Cakes-2201846131435230.jpgTammy Grueser (Swisher & Lohse Pharmacy), Rosemary Eskew (Pomeroy Flower Shop) and Tayla Porter (Mark Porter Chrysler, Dodge, Jeep & Ram) judge cakes at the March for Meals fundraiser. 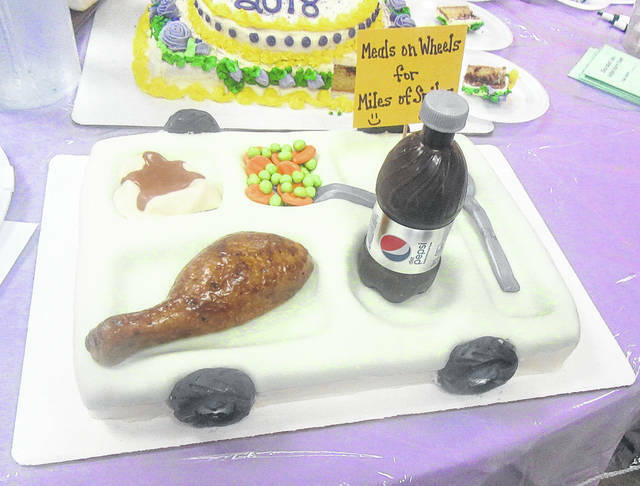 https://www.mydailytribune.com/wp-content/uploads/sites/42/2018/04/web1_4.8-Cakes-3201846131438692.jpg“Don’t Spill the Milk” was one of the many decorated cakes entered in the contest. https://www.mydailytribune.com/wp-content/uploads/sites/42/2018/04/web1_4.8-Cakes-4201846131441748.jpgThe cake decorated by Sammi Mugrage was named the grand champion. 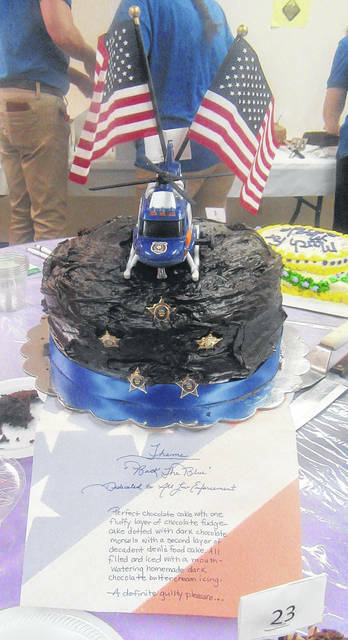 https://www.mydailytribune.com/wp-content/uploads/sites/42/2018/04/web1_4.8-Cakes-5201846131443884.jpgThe law enforcement themed cake by Jeremy Fisher took home the Director’s Award.